Many people are familiar with the ‘umbrella tree’ the large or dwarf variety. 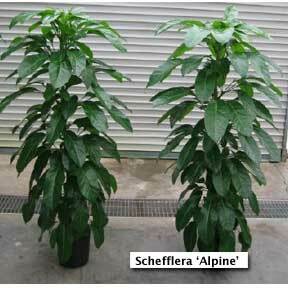 With space being a premium in most homes a tall columnar shaped house plant would work perfectly and where the Schefflera ‘Alpine’ PPAF comes into play. The best variety of the large umbrella tree is the selection known as ‘Amate.’ The column form umbrella ‘Alpine’ is a full compact plant with tight internodes between leaves and requires less space. This works well for both growers and homeowners. Since ‘Alpine’ comes from the ‘Amate’ gene pool it hold all of the characteristics and disease benefits that makes ‘Amate’ such a great plant. ‘Alpine’ is mite and disease resistant, comes clothed with dark green glossy leaves and hold leaves well in low light conditions. When space is an issue and a tall plant is needed give Schefflera ‘Alpine’ a look – it’s the new umbrella tree in town.